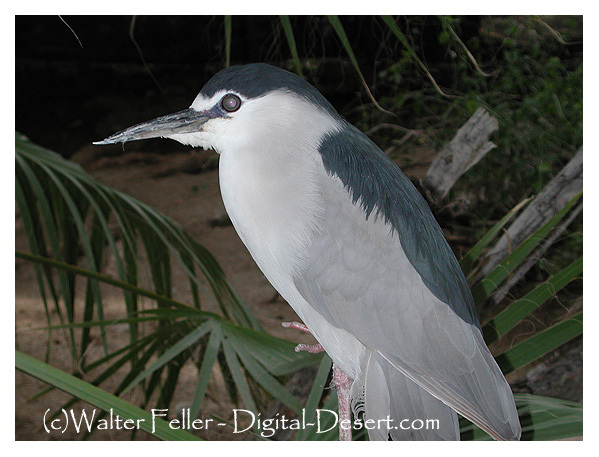 The black-crowned night-heron is a fairly common, yearlong resident in lowlands and foothills throughout most of California, including the Salton Sea and Colorado River areas, and very common locally in large nesting colonies. Feeds along the margins of lacustrine, large riverine, and fresh and saline emergent habitats and, rarely, on kelp beds in marine subtidal habitats. Nests and roosts in dense-foliaged trees and dense emergent wetlands. Common nesting species on northeastern plateau from April to August. Uncommon in northwestern, and rare in northeastern, California in midwinter. Uncommon transient and rare in winter in southern deserts, and rare on Channel Islands. Seldom seen in mountains, but formerly nested at Big Bear Lake in San Bernardino Mts. (Cogswell 1977, McCaskie et al. 1979, Garrett and Dunn 1981). Feeding: Feeds mostly nocturnally and crepuscularly. Highly variable diet consists of fishes, crustaceans, aquatic insects and other invertebrates, amphibians, reptiles, small mammals, and rarely young birds (Palmer 1962, Wolford and Boag 1971b). Collins (1970) and Hunter and Morris (1976) reported feeding on young terns. Usually hunts in shallow water, waiting motionlessly or, less commonly, stalking prey slowly (Kushlan 1976a). Sometimes vibrates bill to lure or flush prey, and may alight briefly on deep water to make a strike. Cover: Roosts among dense foliage of trees, not always near water, and in dense, fresh or brackish emergent wetlands (Grinnell and Miller 1944). Often rests on piers and pilings. Reproduction: Nests in dense-foliaged trees, dense, fresh or brackish emergent wetlands, or dense shrubbery or vine tangles, usually near aquatic or emergent feeding areas. Nests are built of twigs and/or marsh plants. Water: No additional data found. Pattern: Nest-sites usually near aquatic or emergent feeding areas, but nonbreeding-season roosts may be farther away. Activity Patterns: Yearlong, crepuscular and nocturnal activity. Sometimes also feeds diurnally (Terres 1980). Seasonal Movements/Migration: Local migrator, dispersing widely from breeding colonies after nesting (Gill and Mewaldt 1979). Much of the breeding population from northwestern and northeastern California probably moves southward and is absent from those areas in midwinter. Home Range: In North Carolina, foraged up to 8 km (5 mi) from nesting area (Custer and Osborn 1978). Territory: Breeding territory, used for courtship, copulation, and nesting, is large initially, but shrinks after pair-formation to a "few feet around nest" (Palmer 1962). Sometimes defends roosting and feeding territories (Palmer 1962). Reproduction: Breeds mainly February to July, but April to August in northeastern California (Cogswell 1977). Monogamous, colonial nester. Clutch size is 3-4, sometimes 5. Mean clutch size for 684 nests in a South San Francisco Bay colony (Bair Island) in May 1971, was 2.9 eggs (Gill 1977). Incubation reportedly 24-26 days. Semi-altricial, downy young are tended by both parents. They fly first at 6 wk, but are not independent until some time later. A few breed at 1 yr, but most not until 2-3 yr (Palmer 1962, Harrison 1978). Niche: Human disturbance of nesting colonies in Quebec (simulating a typical scientific nesting study) resulted in nest abandonment, predation of eggs, and reduced late-season nesting (Tremblay and Ellison 1979). Corvidae and other predators eat eggs. Numbers have been reduced from drainage of marshes and swamps, and cutting of trees, but this species is more adaptable and persistent than most other ardeids. Allen, R. P., and F. P. Mangels. 1940. Studies of the nesting behavior of the black-crowned night heron. Proc. Linn. Soc. New York 50-51:1-28. Cogswell, H. L. 1977. Water birds of California. Univ. California Press, Berkeley. 399pp. Collins, C. T. 1970. The black-crowned night heron as a predator of tern chicks. Auk 87:584-586. Custer, T. W., and R. G. Osborn. 1978. Feeding habitat use by colonially-breeding herons, egrets, and ibises in North Carolina. Auk 95:733-743. Gill, R. E., Jr. 1977. Breeding avifauna of the South San Francisco Bay estuary. West. Birds 8:1-12. Gill, R. E., Jr., and L. R. Mewaldt. 1979. Dispersal and migratory patterns of San Francisco Bay produced herons, egrets, and terns. North Am. Bird Bander 4:4-13. Hunter, R. A., and R. D. Morris. 1976. Nocturnal predation by a black-crowned night heron at a common tern colony. Auk 93:629-632. Ives, J. H. 1972. Common egret and great blue heron nest study, Indian Island, Humboldt County, California. Calif. Dep. Fish and Game, Sacramento. Wildl. Manage. Branch adm. Rep. No. 72-9. 41pp. Kushlan, J. A. 1976a. Feeding behavior of North American herons. Auk 93:86-94. McCaskie, G., P. De Benedictis, R. Erickson, and J. Morlan. 1979. Birds of northern California, an annotated field list. 2nd ed. Golden Gate Audubon Soc., Berkeley. 84pp. Palmer, R. S., ed. 1962. Handbook of North American birds. Vol. 1. Yale University Press, New Haven, CT. 567pp. Terres, J. K. 1980. The Audubon Society encyclopedia of North American birds. A. Knopf, New York. 1100pp. Tremblay, J., and L. N. Ellison. 1979. Effects of human disturbance on breeding of black-crowned night herons. Auk 96:364-369. Wolford, J. W., and D. A. Boag. 1971a. Distribution and biology of black-crowned night herons in Alberta. Can. Field-Nat. 85:13-19. Wolford, J. W., and D. A. Boag. 1971b. Food habits of black-crowned night herons in southern Alberta. Auk 88:435-437. Life history accounts for species in the California Wildlife Habitat Relationships (CWHR) System were originally published in: Zeiner, D.C., W.F.Laudenslayer, Jr., K.E. Mayer, and M. White, eds. 1988-1990. California's Wildlife. Vol. I-III. California Depart. of Fish and Game, Sacramento, California. Updates are noted in accounts that have been added or edited since original publication. These birds stand still at the water's edge and wait to ambush prey, mainly at night. They primarily eat small fish, crustaceans, frogs, aquatic insects, and small mammals. During the day they rest in trees or bushes.